Meet your guide at Porta Napoli at your chosen start time, either morning or afternoon, to begin your private tour of Lecce, one of the jewels of Puglia. Your first stop is more than 2,000 years back in time at the ancient Roman amphitheater right in the center of Lecce in Piazza St Oronzo. It dates from the 2nd century AD, and is a beautifully-preserved semicircle that once held 15,000 in its audience. Next, watch an artisan at work creating the city’s traditional papier-mâché art. Then explore some of the gorgeous Baroque architecture of Lecce that has led to its nickname, “Florence of the South.” The best example of the Baroque style in the city is the Basilica di Santa Croce. 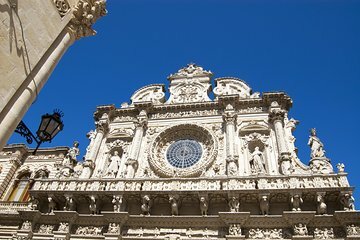 Listen to your guide explain what Lecce was like during its peak artistic period, from the 16th through 18th centuries, as you admire the ornate façade of the church. Venture inside and the artistic era shifts to the less extravagant Renaissance style. Nearby, don’t miss the 17th-century Governor’s Palace, which was once a monastery. Visit the Piazza del Duomo next, over which the Lecce Cathedral looms. This square is considered the city’s epicenter. From there, walk to a 16h-century palace that is now a private museum with one of the city’s most beautiful secret gardens. Your tour concludes back where it began, at Porta Napoli.